Manami Matsumae is best known for composing the legendary music for the original Mega Man (1987), including its iconic "Game Start" jingle. Following her departure from Capcom in 1991, she became a freelance video game music composer. The soundtracks she worked on afterwards include the Derby Stallion series, several Game Boy titles developed by Sunsoft, and other games such as The Adventures of Lolo, Another Bible, Jade Cocoon 2, and Dragon Quest Swords: The Masked Queen and the Tower of Mirrors. 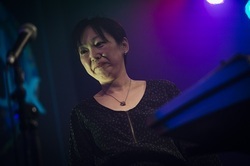 In more recent years, Matsumae has returned to the Mega Man series via Inti Creates, serving as a regular guest arranger for its album releases and joining several other former Mega Man composers in creating the Robot Master themes for Mega Man 10 (2010). Matsumae joined Brave Wave when it was founded in early 2014 and has released several original standalone tracks under the label, such as "One Shot, One Kill" (2013) and "Blue Star" (2014, featuring Tim McCord of Evanescence). She has collaborated on tracks with other video game composers such as Chipzel (Super Hexagon) and Keiji Yamagishi (Ninja Gaiden). Through Brave Wave she has also contributed to the soundtracks of Western indie releases, including Shovel Knight (2014), Mighty No. 9 (2015), Heart Forth Alicia (2016) and Starr Mazer (TBA).